Duplicate Killler News - The new version of Duplicate Killer, with Junk Contacts removal functionality, has been released! The latest Duplicate Remover feature - Junk Contacts removal - has been included in Duplicate Killer. Search and remove contacts that have too little useful information and are considered "junk" contacts. The duplicates report dialog has also been redesigned to offer an improved functionality. 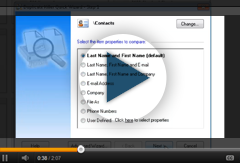 Removal and management of Junk Contacts. Redesigned duplicates report dialog with improved functionality. Compatibility with the latest Windows 8 and Office 2013. Several fixes and improvements in program stability and performance.